Aarhus Letbane, day 2 after opening. L1106 northbound, passing the southbound platform of the "Vandtårnet (Ringvejen)" stop. The northbound platform can be seen in the background, just ahead of the tram. 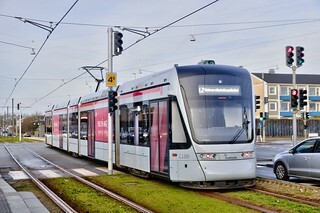 On december 21st 2017, after countless delays and test-drives equalling the distance twice around the globe, Aarhus Letbane (Aarhus Light Rail) was finally inaugurated. To celebrate the day, rides were free and locals and tourists alike grabbed the chance to go for a test run. The first route, opened on this day is rather short and mainly covers the inner city of Aarhus, connecting the main rail station Aarhus H to the hospital Skejby Sygehus north of the city centre. The Odder-route is currently scheduled to open in "early 2018" while the Grenaa branch should follow later that year. 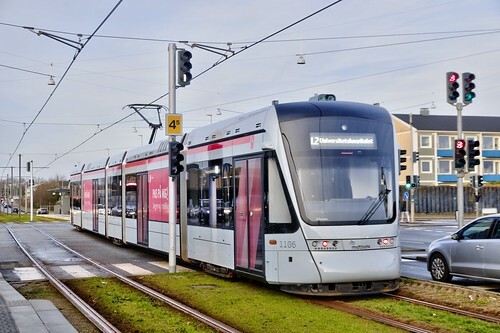 The introduction of a light rail system in Aarhus brings many advantages, but also comes at a price, in more ways than one. In order to finance the construction and daily running, several bus routes have been reduced or completely abandoned, including quite a few in areas not benefitting from the light rail, so opinions on the project are divided, since for some, public transportation has not been improved, but severely worsened.